A Marshfield man who drove to Madison to kill an abortion doctor faces federal charges after he was arrested Wednesday night when his gun went off in his motel room not far from the Planned Parenthood clinic that he planned to attack Thursday. Ralph Lang, 63, told a Madison police officer at the Motel 6, 1754 Thierer Road, that he had a gun "to lay out abortionists because they are killing babies," according to a criminal complaint filed Thursday in U.S. District Court. Lang said he planned on shooting the clinic's doctor "right in the head," according to the complaint. Asked if he planned to shoot just the doctor or nurses, too, Lang replied he wished he "could line them up all in a row, get a machine gun, and mow them all down," the complaint said. In fact, this is religiously-motivated terrorism. According to the report, Lang had been in Madison a week earlier -- with a gun -- "but was having 'spiritual struggles' and was not '100 percent in sync with God' so he did not shoot anyone." The Madison clinic was apparently to be the first of many, as he had "a map of the U.S. with dots in each state and the handwritten words 'some abortion centers.'" Also on the map: the words, "Blessed Virgin Mary says Hell awaits any woman having an abortion." Yeah, this is terrorism -- good old-fashioned religious extremist terrorism. Lang was found out after accidentally firing a bullet through his motel room door. If it weren't this example of responsible gun-ownership, it seems likely that he would've been able to carry out his planned shooting spree. 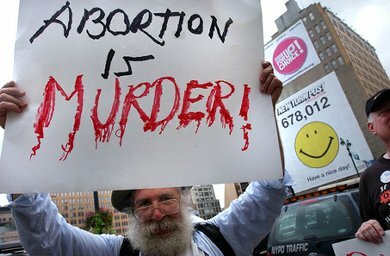 According to the National Clinic Violence Survey (pdf), carried out by the Feminist Majority Foundation, nearly one quarter of abortion providers experienced "severe violence" at their clinics in 2010. Overall, the percentage of clinics experiencing severe violence has increased to 23.5% of all abortion providers participating in the survey in 2010, compared to 20% in 2008 and 18.5% in 2005. Moreover, this marked the highest level of violence recorded since 1997 when 25.0% of all clinics experienced one or more incidents of severe violence. The right often makes the hyperbolic claim that liberals are "in bed with terrorists." Many of the birthers believe that President Obama is a terrorist. Yet, if this clinic violence is homegrown terrorism, then the party most associated and sympathetic with terrorists is the Republican Party. If you tell people over and over that abortion is murder, this is the predictable result. If you want to make sure this is the result, you lie to people and tell them they're paying for all the "murder" with their tax dollars. It was, after all, House Republicans who attacked Planned Parenthood funding earlier this spring, portraying the organization as an abortion provider only and completely ignoring the services it provides in the field of women's health. It was Republican Sen. Jon Kyl who claimed that abortion was "well over 90 percent of what Planned Parenthood does." The reality is three percent -- none paid for with taxpayer dollars. What would Republicans say if Democrats were telling the same lies that are told by al Qaeda? I think we all know the answer to that. Yet Republicans repeat the lies told by anti-abortion terrorists on a regular basis. Maybe it's time to ask the question of Republicans that they would no doubt ask of Democrats in a similar situation. "Why are you siding with terrorists?"